It happened last Saturday. I got to live my dream of riding on the back of a bike while playing my harp. We rode 12 miles from the one end of the Minuteman Bike Trail in Bedford, through historic Lexington and to the other end in Arlington, MA. I was playing and singing the whole time, while bike wizard Dave Enos pedaled and steered. He also put the whole contraption together (all except the harp and me). 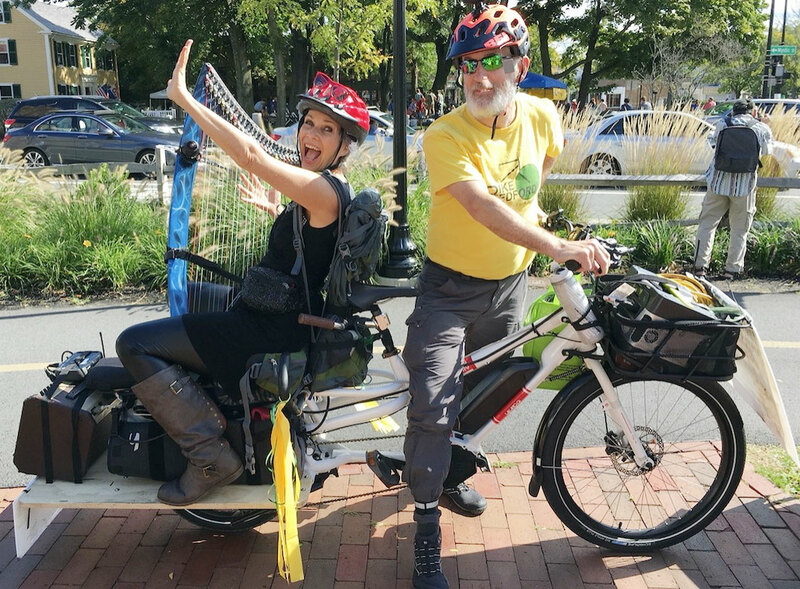 We were celebrating the 25th anniversary of the bike trail and it all happened because …. I ran into Cecily Miller on the bike path a few months ago. I’ve known Cecily for years, ever since we were both on the Somerville Arts Council, weathering passionate funding fights for local artist projects. She said, “Well, I don’t know about Michael Dukakis … or a parade,” but I can see about getting you on the back of a bike. A few weeks later she connected me with Dave Enos, who’s passionate about bikes and one of those fascinating “gadget guys.” He and his wife, Suzy, were a big part of the celebration, managing tables and waterbottles … and me! It was so much fun to watch Dave figure out the logistics of how this would all work. At first he planned to haul me behind the bike with a chair attached to a bike trailer. 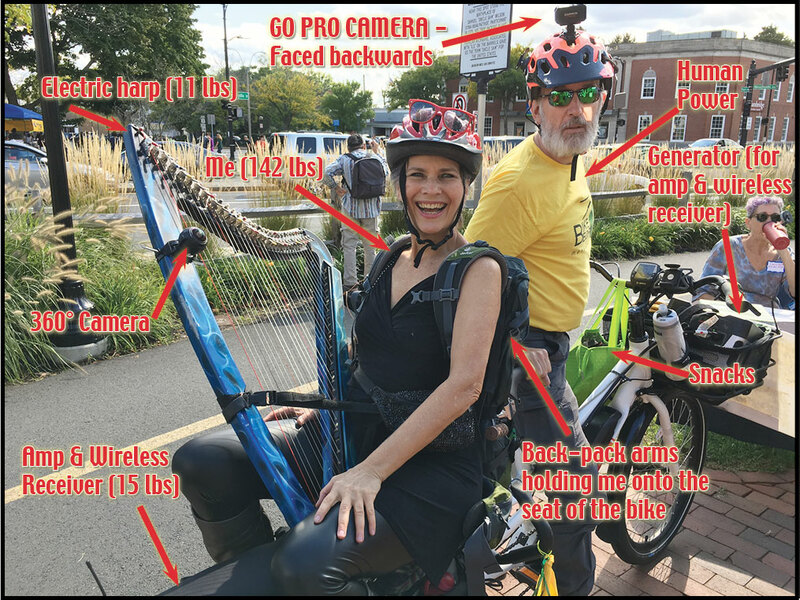 But after he watched my TEDx talk, and I told him the harp only weighed 11 pounds, he came up with the idea of just putting me – and all my gear – right on the back of his bike. And that’s how we rode from Bedford to Arlington, me singing and playing the whole way. 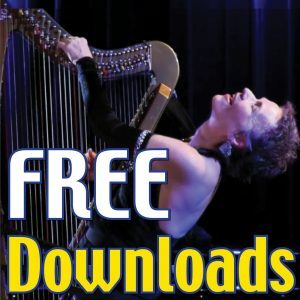 So if you saw us – and you took pictures, please share them on Twitter, Instagram or Facebook with the Hashtag #HarpBike – and let me know you did! I know lots of people took pictures (sometimes it made me a little nervous, since they were riding bikes while they did it) – but I’ve only seen a couple and I’d love to see more! And when we get the footage from the camera on my harp and Dave’s helmet, I’ll share that, too.